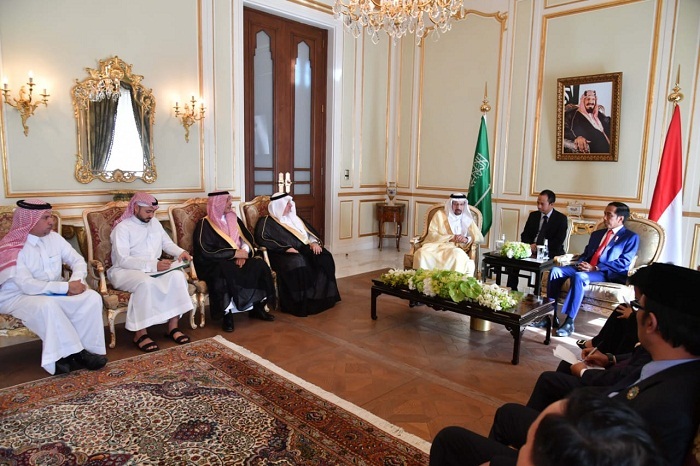 President Joko “Jokowi” Widodo during his visit to Saudi Arabia received a courtesy call from the Saudi Arabian Minister of Energy, Industry and Mineral Resources Khalid Al-Falih at the Royal Guest House, Riyadh, Sunday (14/4). Minister of Foreign Affairs Retno Marsudi, who accompanied the President at the meeting, said the Minister of Energy, Industry and Mineral Resources of Saudi Arabia expressed his appreciation for various measures taken by the Indonesian Government that have attracted Saudi Arabian companies to establish cooperation with Indonesian companies. “One of the other issues discussed in the meeting was the possibility of cooperation between the country’s oil company Aramco and Indonesia’s state-owned oil and mineral company Pertamina for the Cilacap refinery,” Retno said. Regarding the issue, Retno said the two countries are still discussing the issue of asset valuation of both companies and it is expected to be resolved immediately. “President Jokowi will hold a meeting with several ministers to solve the problem,” she added. According to Retno, the Saudis also expressed their interest to cooperate in the field of petrochemical industry. “Several Saudi Arabian representatives will visit Indonesia to further discuss those issues,” Retno said.